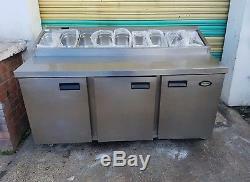 Commercial FOSTER undercounter 3 DOOR fridge 9 pots. Dimension: Wide: 172 Deep: 85 High: 106 cm. An excellent condition and perfect working order. Ser viced and tested by our Engineer. Supply with 4 shelves and beautiful stainless steel body. Note: this price does not include pots and lids. 32 Thames Road, Barking, Essex IG11 0HZ. For more details please contact. 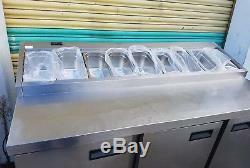 The item "Foster under counter three 3 door pizza topping salad preparation fridge 9 pots" is in sale since Wednesday, May 23, 2018. This item is in the category "Business, Office & Industrial\Restaurant & Catering\Refrigeration". 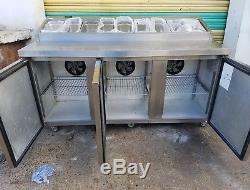 The seller is "mj_commercial_catering_equipments" and is located in Barking (East London). This item can be shipped to United Kingdom.